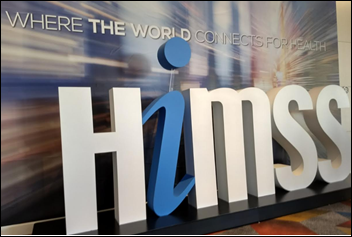 HIMSS18 Day 1 is on the books. I’m not really sure if it’s Day 1 or Pre-Day 1, but it’s over regardless. There wasn’t a moment today where it didn’t feel like Sunday instead of Monday. From Ulterior Motive: “Re: Fujitsu. They are exiting the healthcare vertical business even though they claim to focus on B2B with an emphasis on verticals. This aligns with the pending acquisition from Lenovo. That leaves the industry with Lenovo, HP, and sometimes Dell for mobile computing devices. Guess it is now time for Apple and potentially Microsoft if they can fix Surface.” Unverified. 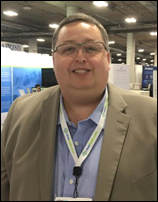 Cerner and Salesforce will collaborate to integrate to offer their combined population health management and CRM solutions, respectively. We’re surrounded by grotesquely Americanized phony views of the real world and the worshiping of excess, debauchery, and conspicuous consumption. Sorry, wrong picture – I was looking for one from the exhibit hall. It’s kind of like the running of the bulls in Pamplona, except that the slower-moving targets of rage are the health IT nerds thinking that they are expert multi-taskers in being able to screw around with their phones while walking and failing to notice that they’ve almost stopped mid-walkway due to lack of CPU cycles to smoothly accomplish both. They deserve to be trampled by tailgaters who are locomoting more decisively to their destination. 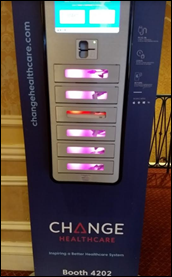 Change Healthcare has installed these cool device charging stations all over the convention center. You use your credit card to lock your charging device in its own little compartment and then retrieve it later. I brought external batteries saved from previous HIMSS conferences, so I should be set. 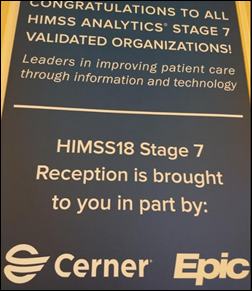 Cerner and Epic finally agree on something. Hey, look at the HIMSS-provided free refreshment bar! I actually grabbed a few pens and notepads since those are hard to find (the latter, especially) in the exhibit hall. And an ice water. 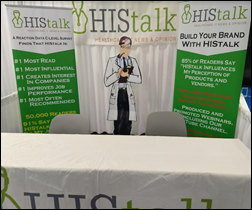 Here’s our magnificent tribute to cost-effective exhibiting: two new pull-up signs ($75 each, free shipping), a new Smokin’ Doc standee ($75), and our old table cover and banner (which frankly could have used a touch of the iron after being hauled around for years in a duffel bag). Still, I’m excited that we at least accomplished something – a nearby Hall G booth neighbor caught Lorre before our booth was even set up and asked for the “Cellar Dweller Special” new-sponsorship bonus special I mentioned the other day. They’ll benefit for a full year at a fraction of their exhibit hall cost and we’ll feel a little bit better about squandering money on a booth. I’ll be sweating tomorrow that I’ll hear that our booth is dead. 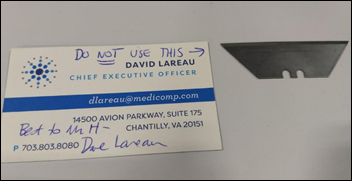 A witty welcome gift – a sort of “found objects” art display — was awaiting us at our empty booth from our old HIStalk friend, Medicomp CEO Dave Lareau, who clearly understands our bifurcated feelings about the conference. Actually, Hall G is much nicer than I remember, with reasonably high ceilings. Our aisle is pretty wide an inviting, with the only real negative being that it’s like a mall that has lost its anchor tenants and thus its foot traffic. I’m sure some great companies are down there with us, so show your discriminating taste in seeking out vendors that the hoi polloi can’t appreciate, like boutique wineries that aren’t interested in selling to the masses. 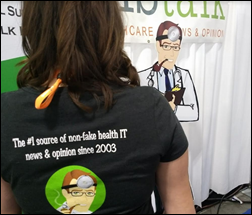 I caught my booth crew (both of them) wearing tee shirts I hadn’t seen, finally extracting their eye-averting confessions that they have a bunch of them with plans to use them for unstated purchases. I suppose I should overlook their lack of transparency, applaud their self-directed management, and at least be happy that they chose to memorialize The Smokin’ Doc. I’ve already bet money that at least one person who feels gifted with unusual insight will loudly question why a doctor is smoking a pipe. It’s called intentional irony, humorless people of the world. Lorre struggles every year trying to hang up our booth stuff by herself since the drape holders are taller than she is. 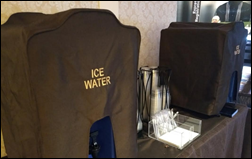 Stepping in chivalrously to help was booth neighbor Bill Schriver, a US Navy veteran and senior manager from Atlanta-based consulting firm Avelead. Lorre wants to thank Bill in this way – show up at their Booth #11325, ask to meet Bill, and tell him Lorre sent you. The first three people that do that will get one of the tee shirts you see above. We apparently have both the usual men’s version as well as more flattering ones designed specifically for women, which isn’t always the case with giveaways. You might as well thank Bill for his service while you’re visiting. 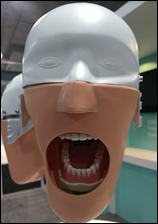 Another booth neighbor is displaying this thought-provoking item, which I like to think is an abstract, wry commentary on the exhibit hall – the de-humanized protagonist has his mouth wide open talking loudly while carefully covering his eyes and ears to avoid being distracted by listening. Maybe I’m overthinking it. The entire convention center now resembles the gambling machines that surround it, replete with ad-displaying monitors that feature eye-catching bright lights. The first word I heard upon entering the convention center today was “blockchain,” part of too-fast, too-enthusiastic pitch some guy was delivering via his phone. 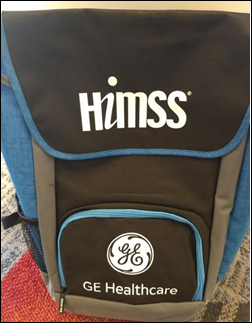 Great job on the backpacks, GE Healthcare. It’s a keeper – large, lightweight, and featuring nice straps and a magnetic closure. They chose well in designing it purely to work as a backpack, with symmetrical straps and a single, centered top handle that doesn’t try to emulate a handbag or briefcase and thus failing all possible use cases. Hall WiFi was free and pretty good at 25 Mbps, although that will get dragged down significantly Tuesday when it gets overloaded by attention-deficit geeks desperate to mate with their electronica. Food was a bit hard to find near the action today since most of the concessionaires operate only from stands inside the still-closed exhibit hall. 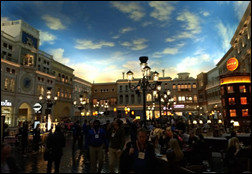 I didn’t want to pay $30 for lunch, so I headed up to the Grand Canal Shoppes food court that had a lot of options for under $12. I had a pretty good Indian lunch from Curry Pot, whose naan and cumin seed basmati rice that came with the chicken tikki masala making the temporary carb loading worth it. I attended the first part of the lackluster opening keynote session that didn’t start until 5:00. It led off with dull singing from TV talent show winners backed by pre-recorded tracks in singing irrelevant songs that ranged from “Hallelujah” to the retch-inducing “Don’t Stop Believin’” and finishing with the puzzling “Somewhere Over the Rainbow,” all of it embellished with gratuitous vocal gymnastics, background slides that missed “inspirational” while hitting “cliche” in trying to tie together with an emotional thread disasters both natural and intentionally caused, and the absence of the original songwriters or performers (it was karaoke, basically, and not in a “like Leonard Cohen sang it” sort of way). I can’t decide if I was more embarrassed when a few people cheered and clapped as though Better Midler had just belted out a number vs. the stern, besuited guys shown on the projection screens who seemed to fear that any show of emotion might burst their tightly buttoned collars. 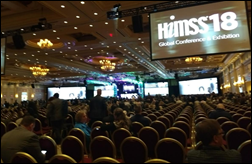 I guess it’s tough to program music for the older, button-down crowd that attend HIMSS, but I would rather have just skipped the music entirely to get us all out to dinner earlier. 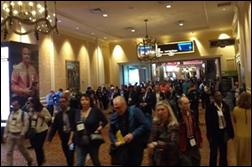 They said in the opening session that the room was full at 7,000 people and that 43,000 people had registered for the conference, although I don’t know if those were official numbers. Eric Schmidt, who has held (and lost) all the key positions at Alphabet/Google while amassing $14 billion, got off to a good keynoter start before I had to leave (HIMSS wasted a ton of stage time before he was allowed to start at 5:45). He talked about technology in medicine, calling AI-powered image analysis “a solved problem” in which machines performs far better than humans. He mentioned the new Google Cloud API and urged the industry to “run to the cloud” and get off their poorly managed and secured local servers (he sells the other kind, of course). I had to scoot and missed the rest of his talk, so let me know if he said anything interesting. The most interesting thing was how odd I felt seeing an actual person from Google – unlike Microsoft’s ever-present Bill Gates and Steve Ballmer, I had no idea what anyone from Google looked or sounded like despite my close, constant relationship with its products (Chrome, Mail, Android, search, and so on). Tomorrow is the first day the exhibit all is open, so I’ll be cruising and possibly attending some educational sessions that I’ve highlighted. Email me if there’s something I should see or if you hear interesting news or rumors that I can use. Not liking sarcasm here, why are you constantly bashing on others, big shot? I didn’t see you on stage performing, so I don’t think you’ll need to be a judge of the music. I’ve been writing HIStalk since 2003 and I’ve been sarcastic from the beginning (I’m guessing you’re a new reader since otherwise, why would you have returned knowing what I do and that you don’t like it? ), so it’s probably a bit late to change unless I have a near-death experience or something, although even that might make me even more sarcastic since you never know about stuff like that. You can simply stop reading HIStalk, but I wasn’t given the option to skip the lame opening keynote musical interlude that my fellow attendees and I paid for. But if you were air-drumming in your seat to the painfully overwrought “Hallelujah” that is surely making Leonard Cohen squirm in his grave, then good for you. You’re free to say so like I did, assuming you write a blog as I do.